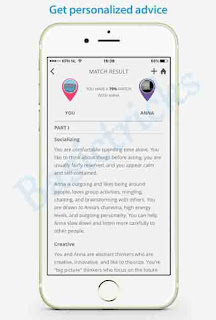 PersonalityMatch: A Personality Test & Comparison App. 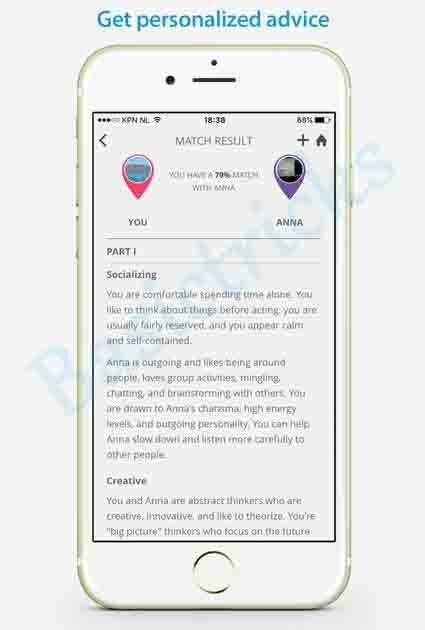 PersonalityMatch: A Personality Test & Comparison App that Cannot be Taken for Granted! : There are many social media apps that let you enjoy the best of your friendships. You can make ‘friends’ with your real-world friends and relatives, and also with people whom you have never ever seen. Then there are many dating apps out there make things even more fun. PersonalityMatch offers you the best of both with a unique approach. It lets you compare your personality with your friends and provides you valuable tips on how you can improve your relationships. That’s something none of the existing social media or dating apps can do. You must have got a knack of what PersonalityMatch can do. This review provides you more details on what it can do for you. 0.1 How Does PersonalityMatch Work? Take a personality test on PersonalityMatch. It identifies your personality as one of the 16 types of personalities. Invite your friends, partner, relatives and even colleagues to conduct their personality test. You can compare your personality with anyone on your friend’s list. 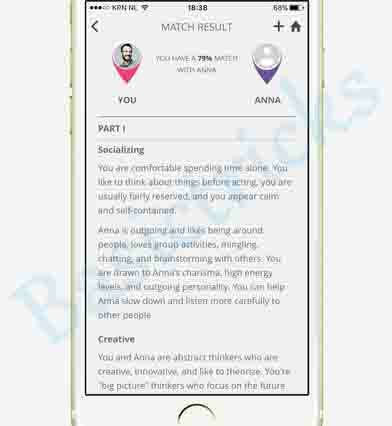 The app has a powerful algorithm that compares two profiles and provides insights into where the two personalities will get along and where there can be potential conflicts. PersonalityMatch will also provide advice/tips on what you can do to improve the relationship with a compared profile. Thus, you can see that PersonalityMatch is not just another social network for making friends. It helps you improve your relationships, which can have long term positive effects in your life. So it’s less of entertainment and more of something that adds value to your life. Now that you know how this app works, it is worth learning about its key features. Unique & Advanced Personality Test: Once you have created a profile on PersonalityMatch, it will ask you 30 questions to evaluate your personality type. 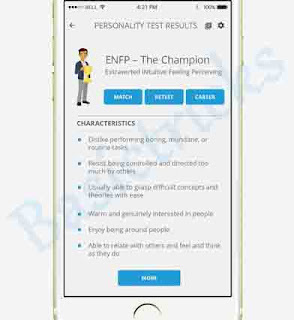 Compare Personality: Once you have completed the test, the app’s algorithm will create your personality. You can now match your own personality with your friends (if they have also completed the personality test). The friends could be anyone – your partner, relatives, colleagues or a friend. Compatibility: Once a comparison is completed, the app will display your compatibility with your friends in the form of a percentage score. Learn About Friends: It will also display what type of personality your friend has. Then, it will also show you the desires and motivations of your friend or partner. This will further help you identify what is common between the two of you. Personalized Advice/Tips: This is one of the biggest features of PersonalityMatch that differentiates it from other types of apps. These tips are based on its algorithm and the psychological tests and conclusions by Isabel Briggs Myers and Katharine Cook Briggs and the findings of the famous psychiatrist, Carl Jung. You can rely on these custom tips to improve your relationships. This personalized advice feature is something unique and makes this app stand out for how it can help make your life better around your loved ones. The advice will help you address the issues that have been hampering your relationship and preventing it from becoming seamless. If you set out to look for such other apps, you will have a difficult time with the search. PersonalityMatch’s algorithm is what makes it different from other similar apps in its segment. The 30 questions are formulated based on proven psychological tests developed by the world’s leading psychologists. So it is not just another app. It has its background in solid scientific studies. Once you run the test and the app compares your personality with a friend, even the personalized recommendations are also made on the basis of psychologists’ theories. 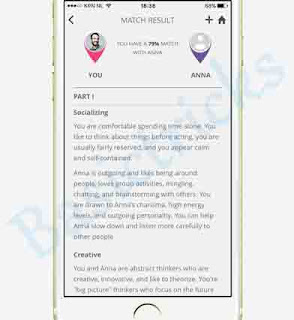 Thus, PersonalityMatch is an app that everyone should use to not only improve their relationships but also to learn about their own personality. It will also tell you things about yourself that you may have never known about. This is another dimension to this app. In fact, the findings and recommendations of this app cannot be taken lightly because they are based on proven psychological theories and findings by some of the most accomplished and well-known psychologists. So if you are not already using PersonalityMatch, you should certainly give a try to see what suggestions it has for you.